Hydro-excavation, or "soft digging", utilizes high pressure water along with a truck mounted vacuum to provide a safe and efficient alternative to traditional excavation methods. 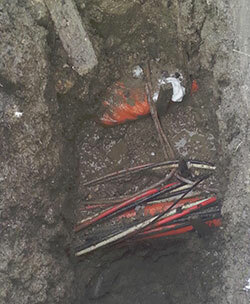 Underground utilities such as gas and water lines, telephone and fiber optic cables, power cables, and other utility infrastructure can be located and exposed, reducing the chance of damage and eliminating potential costly repairs. 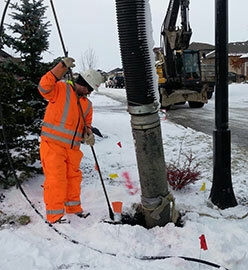 This method is extremely useful in the cold climate, with the ability to cut through frost and frozen ground quickly and efficiently, saving wear and tear on traditional mechanical excavating equipment Traditional excavation methods can create excess damage to trees and landscaping in residential areas. Hydro-excavation allows for remote operation of up to 150 meters in critical or difficult to access areas with virtually no damage to the surrounding environment. Uni-Jet has developed a specially designed shoring system for minimizing large excavations in developed areas or unstable soil conditions. This system allows for shoring to be continuously lowered into the excavation while keeping the hole to a minimum size. After the excavation is completed, a worker can safely enter the shoring, perform any required repairs, remove the shoring, then backfill.